At The Age Of 7 He Started Daily 5 Hours Training To Prepare Himself For Microsoft's Certification Test, After Strict Schedule Of 13 Months That Include School Timing 7:30 Am To 1:30 Pm In The Morning And After School Classes in The Afternoon His Schedule Of Training Was 2:30pm To 8:30 pm, So At The Age Of 8 In Year 2012 Shafay Thobani Passed The Online Microsoft's Test And Became The Youngest Microsoft Certified.Shafay's Father Is Ceo Of Thobson Technology In Karachi , So Shafay's Father And Other Staff Members Helped Shafay Alot To Become World Youngest Mircosoft Certified. Shafay Was Trained By His Father And Co-Workers,And The Place Where He Was Trained, Having a Space Of 1000 Square Foot, And was Included With 3 Desktops,Laptops And Routers. There was a dedicated area for chess, darts and arcade games. So All The Training Hall Was Specially Build For Shafay's Thobani For His Training. Its Only Possible When Your Father Is Ceo Of a Company Or a Richer Like Shafay's Father. 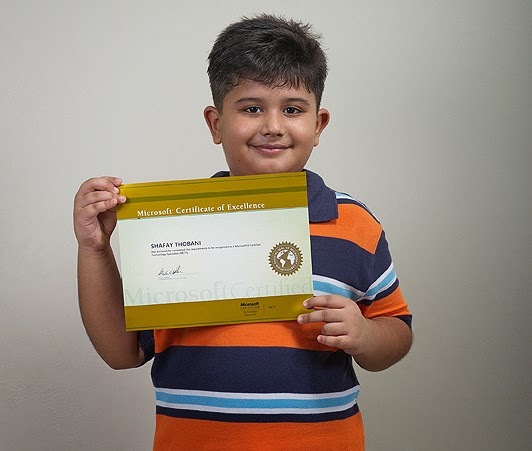 So At Last That Was Impossible For Shafay Thobani To Become World Youngest Microsoft Certified Without Money, And His Talent Was Created By Paid Staff. wow very ncie. Shafay is a world youngest Microsoft certified.